Annibale Carracci (1560–1609), Latona and the Lycian Peasants (date not known), oil on canvas, 90.6 x 78 cm, Arcidiecézní muzeum Kroměříž, Olomouc Museum of Art, Kroměříž, The Czech Republic. Wikimedia Commons. As it progresses through the sixth book, the thread of Ovid’s Metamorphoses remains with the little-known goddess Latona. Mercifully after the slaughter of Niobe’s children, Ovid turns to a far less savage story of divine retribution. This is again narrated by a third party, on this occasion an anonymous one. Long ago in Lycia, at the western end of the south coast of modern Turkey, country people scorned the worship of Latona. The narrator was taken by his father to see an old altar among reeds, which was dedicated to the goddess, marking the birth of her twins, Apollo and Diana. Latona had fled here to give birth in the heat, where she could avoid Juno. When the twins had drunk her milk and she was dry and thirsty under the hot sun, Latona saw a small lake among marshes, where local peasants were cutting reeds. She went down and was about to drink from the lake when those locals stopped her. Latona told them that drinking the water was a common right, and that she only intended to drink and not to bathe in it. The locals continued to prevent her, threatening her and hurling insults. They then stirred up the mud on the bottom of the lake, to muddy the water. they plump again down to the chilly deeps. or even under water, boom abuse. still wider in the venting of their spleen. muddy their own pools, where they leap and dive. Today, this myth has been almost forgotten, but in the past it was very popular, and extensively painted. 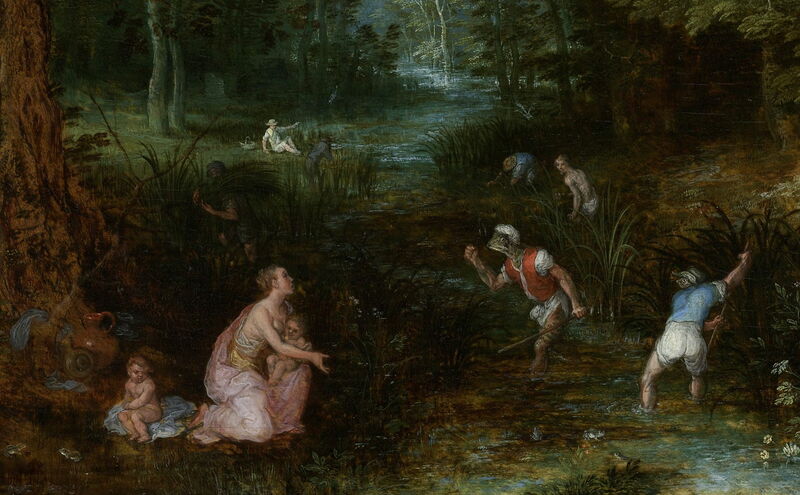 Tintoretto (Jacopo Robusti) (1519–1594), Latona Changing the Lycian Peasants into Frogs (1545-48), oil on panel, 22.6 × 65.5 cm, Courtauld Institute of Art, London. Wikimedia Commons. Tintoretto’s lovely panel of Latona Changing the Lycian Peasants into Frogs from 1545-48 is one of the earliest of the ‘modern’ paintings, and keeps closely to Ovid’s story. 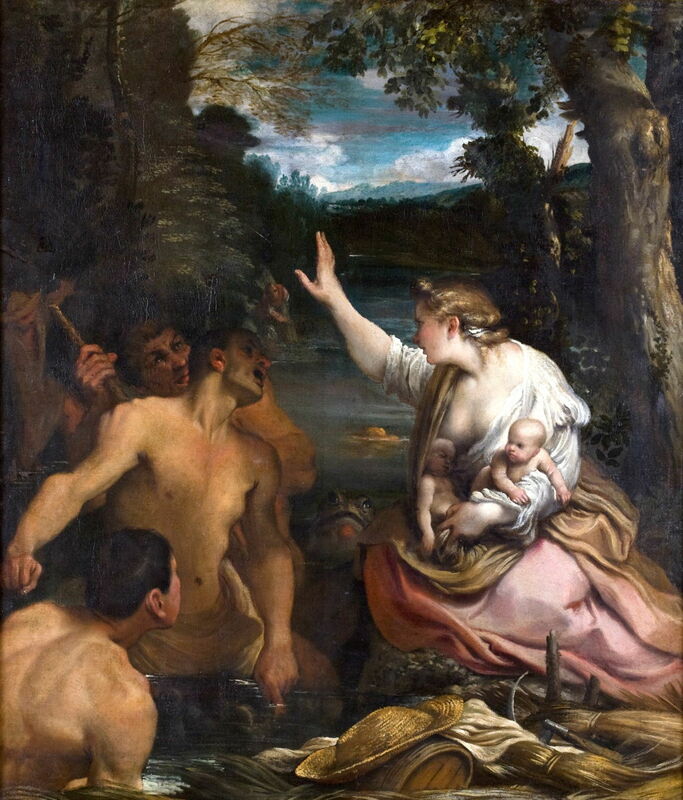 Latona rests a baby on each hip as she tries to enlist the co-operation of the Lycians, who are becoming more froglike but have not yet been transformed. Annibale Carracci’s Latona and the Lycian Peasants probably from 1590-1620 is the first truly masterly painting of this myth. Latona is here placing her curse on the locals, and behind them one appears to have already been transformed into a frog. Although the babies’ heads are disproportionately small (as was the case for several centuries), they and their mother are very realistically portrayed, and contrast markedly with the uncouth and obdurate locals. Jan Brueghel the Elder (1568–1625), Latona and the Lycian Peasants (1595-1610), oil on panel, 37 × 56 cm, Rijksmuseum Amsterdam, Amsterdam, The Netherlands. Wikimedia Commons. It is, though, Jan Brueghel the Elder’s panel showing Latona and the Lycian Peasants (1595-1610) which is the biggest surprise among these paintings. Set in a dense forest – probably quite inappropriate for Lycia – the locals are busy cutting reeds and foraging. Latona, at the bottom left, is seen remonstrating with a peasant, over to the right. As the detail below shows, the goddess is in need, as are her babies. The peasant closest to her, brandishing his fist, is already rapidly turning into a frog. There are many other frogs around, including a pair at the bottom left corner, near the feet of one of the babies. Jan Brueghel the Elder (1568–1625), Latona and the Lycian Peasants (detail) (1595-1610), oil on panel, 37 × 56 cm, Rijksmuseum Amsterdam, Amsterdam, The Netherlands. Wikimedia Commons. David Teniers the Younger (1610–1690), Latona and the Frogs (c 1640–50), oil on copper, 24.8 × 38.1 cm, Fine Arts Museums of San Francisco, San Francisco, CA. Wikimedia Commons. 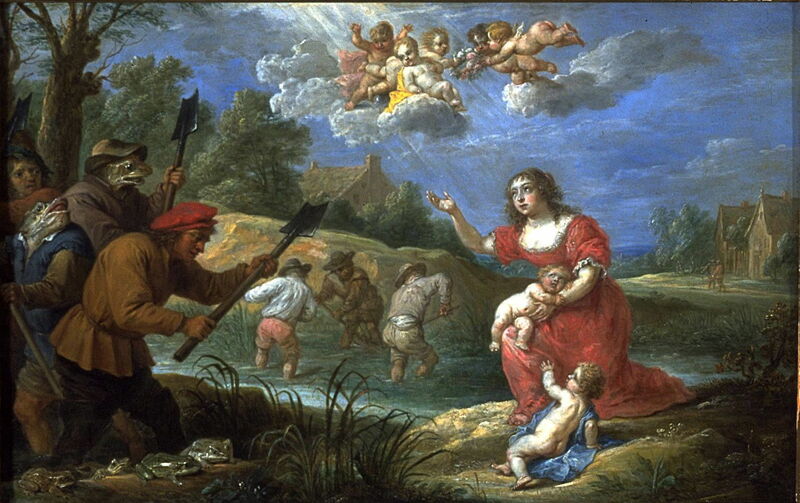 David Teniers the Younger’s Latona and the Frogs from around 1640–50 is not perhaps in the same class as Brueghel’s, but still tells the story well, and shows Lycians being transformed for refusing to help the goddess. 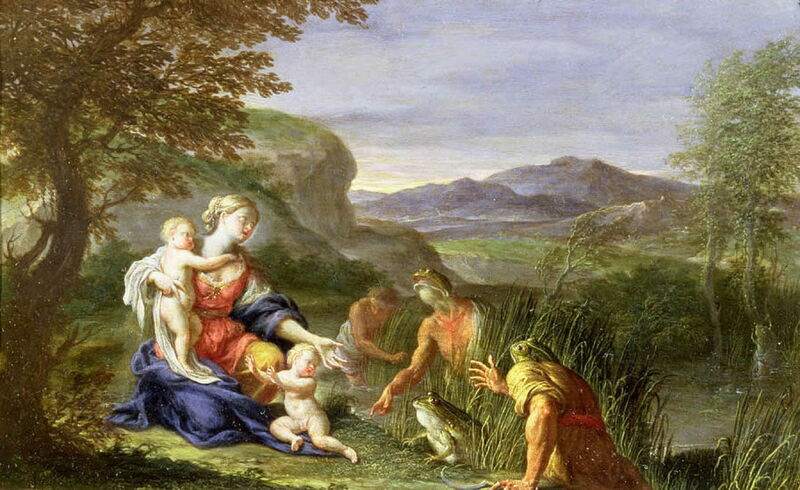 Francesco Trevisani (1656–1746), Latona and the Frogs (date not known), oil on copper, 16.1 × 26.3 cm, Private collection. Wikimedia Commons. 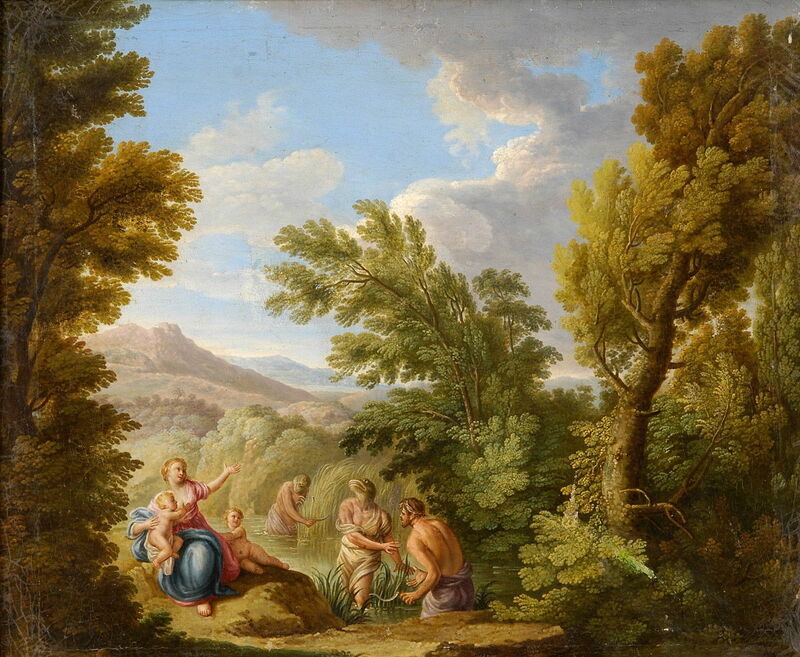 Francesco Trevisani’s Latona and the Frogs from the late seventeenth or early eighteenth century is, like Tenier’s, painted in oil on copper. Even as his peasants are turning into frogs, they are still refusing to let Latona drink from their lake. François Lemoyne (1688–1737), Latona and the Peasants of Lycia (1721), oil on canvas, 77.5 × 97.8 cm, Portland Art Museum, Portland, OR. Wikimedia Commons. François Lemoyne’s Latona and the Peasants of Lycia (1721) stops short of showing the metamorphosis, or any frogs, but Latona and the peasants are clearly engaged in their dispute. 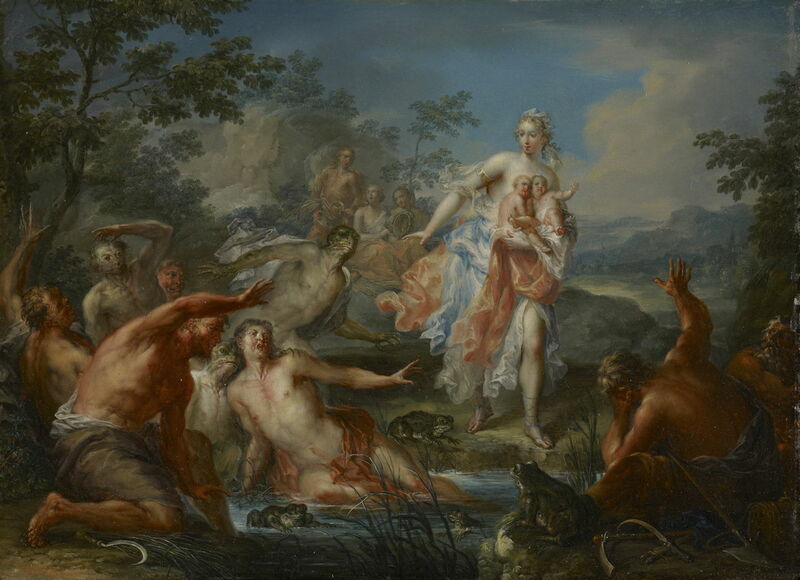 Johann Georg Platzer (1704–1761), Latona Turning the Lycian Peasants into Frogs (c 1730), oil on copper, 21.6 × 30.5 cm, Minneapolis Institute of Art, Minneapolis, MN. Wikimedia Commons. 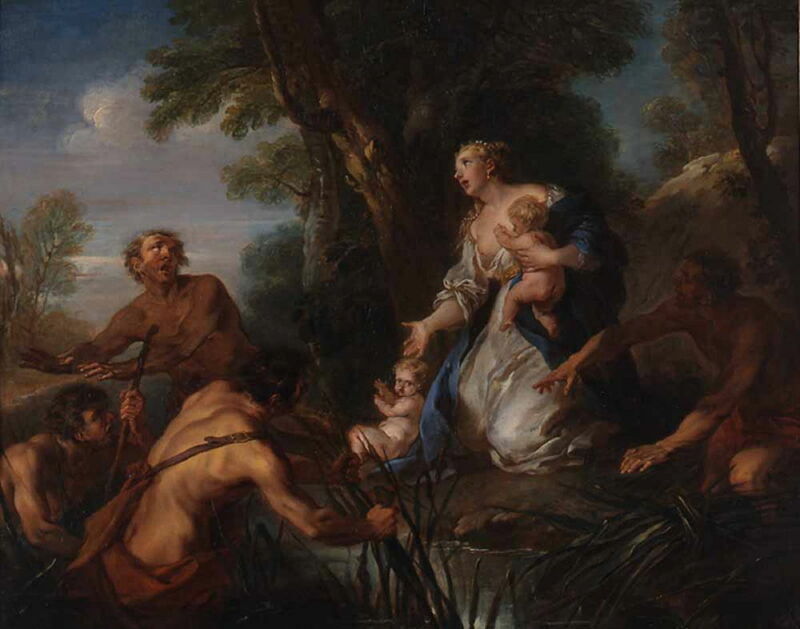 Johann Georg Platzer’s Latona Turning the Lycian Peasants into Frogs (c 1730) is another fine work on copper which shows all the key elements of the story, including the rather macabre appearance of the peasants as they are transformed. Unknown Artist, Italian Landscape with Latona and the Lycian Peasants (c 1750), oil on canvas, 64 × 76 cm, location not known. Wikimedia Commons. The artist who painted this Italian Landscape with Latona and the Lycian Peasants sometime in the middle of the eighteenth century has not been identified. That is a pity, as it depicts the story well, with the head of two of the peasants already assuming the form of frogs. Gabriel Guay (1848–1923), Latona and the Peasants (1877), oil, dimensions not known, Château du Roi René, Peyrolles, Provence, France. Wikimedia Commons. 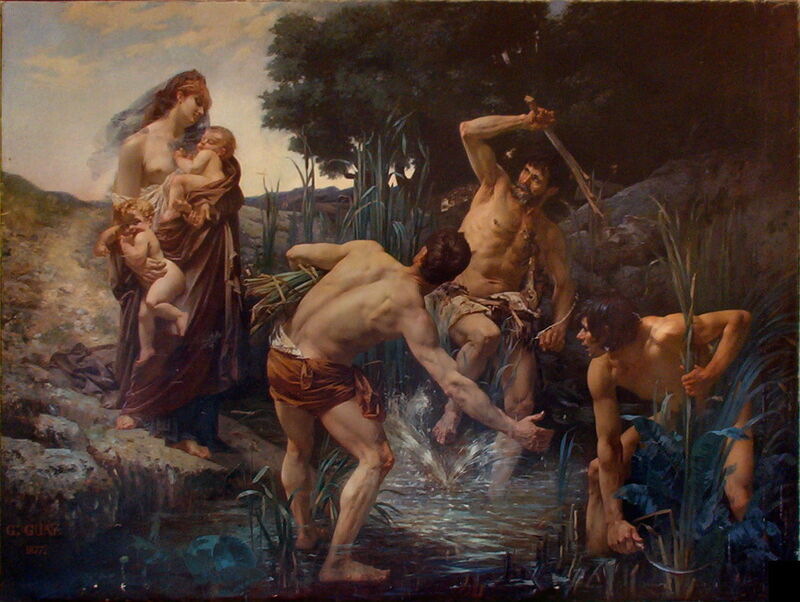 The story survived in narrative painting well into the latter half of the nineteenth century, when Gabriel Guay painted his Latona and the Peasants (1877). Latona and her babies now seem not just real but almost contemporary, which minimises her divinity. The peasants are here engaged in muddying the waters. Guay was a pupil of Jean-Léon Gérôme, who went on to become a professor at the École des Beaux-Arts. His first painting was accepted for the Paris Salon in 1873, so this is one of his earlier works. Despite winning silver medals at the Universal Expositions in Paris in 1889 and 1900, and sustained success at the Salon, his work is now almost entirely forgotten. 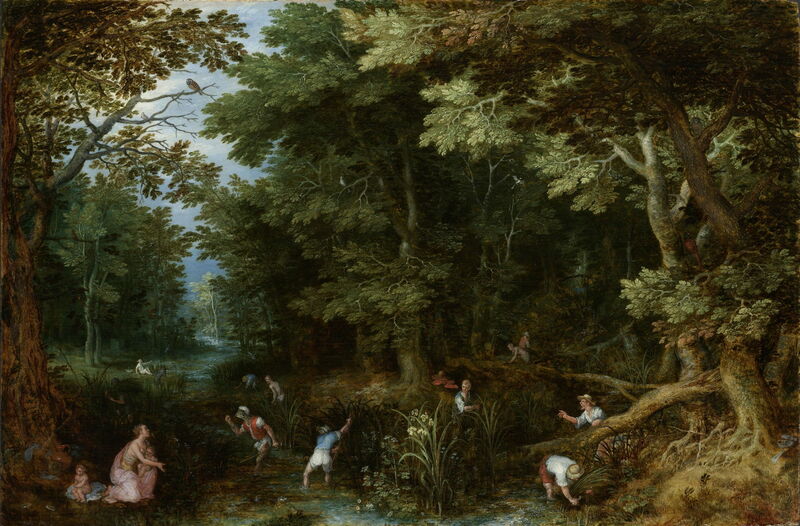 There are three magnificent paintings of this tale, by Carracci, Brueghel, and Platzer, but there’s something really rather special about the Brueghel, don’t you think? Posted in General, Language, Life, Painting and tagged Bruegel, Brueghel, Carracci, Guay, Latona, Lemoyne, Metamorphoses, myth, narrative, Ovid, painting, Platzer, Teniers, Tintoretto. Bookmark the permalink.